There are many different types of wooden candle holders, ranging from ornate inlaid designs to roughly carved pieces of wood. Each type has been designed to show off a candle and the light that it produces in the best possible way. These are a lovely way to display natural candles of all types. Candle holders can be created from many materials, but one of the most ancient and interesting is wood. For hundreds of years, civilizations from around the world have used wood to hold candles. Carpenters and wood carvers can use just a few basic pieces of equipment to make lovely candle holders. There are many different types and styles of candle holders that are made from wood. The choice ranges from large wooden chandelier type candle holders that look fantastic as a centerpiece, through smaller and more subtle candle holders. Wood is often used in ethnic designs, such as African candle holders, as the wood looks particularly good when carved into different and interesting designs. Great outdoor candle holders can be found that are simply a log or large plank of wood, with large holes drilled to hold tea lights. These great tea light holders can add a whimsical touch of candlelight to an outdoor party or create a romantic ambiance in the garden. Wooden candle holders can be found in a wide range of colors. The color of the wood candle holder will be determined by two factors. One is the natural color of the wood and the second is whether the wood has been treated with dye or paint. Pale Shades - Pale cream colored woods look lovely in contemporary settings. The types of pale wood that are commonly used are pine and beach. These light colors work well with a variety of designs and are often found in simple and striking shapes. Dark Shades - When people think of wood candle holders, the image that first springs to mind is the traditional dark oak colored designs. Oak is a hardwood and it can be carved or turned into many interesting shapes and styles. The dark oak sets off candlelight and works particularly well with large light colored pillar candles. Wood can be painted and dyed. This means that candle holders made from wood can be found in a wide variety of colors. Colored candle holders are a great way of coordinating décor in a room while complementing other pieces of furniture and accessories. 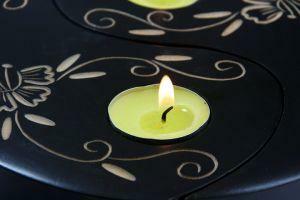 In addition to buying ready colored wooden holders, it is also possible to paint untreated candle holders. This is simple to do and suitable paints are readily available from craft and hardware stores. It is important to ensure that the paint is fire resistant, however. The supplier or vendor will be able to give advice on this issue. Budget - Setting a budget when buying wood candle holders is useful. Simple mass produced candle holders are readily available. Hand carved or turned candle holders are much more expensive, reflecting the amount of work and the quality of the materials involved. Setting a budget will help to focus the search for the perfect candle holder. Type - With such a wide choice available, deciding what type of candle holder is required will help to narrow the search. Part of the decision will be based on the type of candles that are going to be used and choosing the right candle holder for that particular style of candle. Location - If a candle holder is to be displayed in a certain location, then consideration as to the size and shape of the design is important. A candle holder that is too large or too small can look out of place and spoil an otherwise wonderful décor. No matter what design you select, a wooden candle holder will be a lovely addition to any room.